We are farmers who use the vegetables we grow to produce artisan pickles. Our acidified products include Bread and Butter Pickles, Pickled Summer Squash and Pickled Beets. We enjoy growing many varieties of peppers and use them to make our different version of Pepper Jelly. 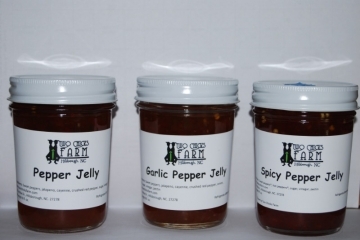 Our Pepper Jelly uses seven varieties of peppers. Also, we are making raw lacto-fermented products such as several varieties of Dill Pickles, Sauerkrauts, Sauerruben, Kimchi and more. All of our processing is done in small batches in our commercial kitchen. We included a temperature controlled fermentation room in our kitchen to provide the best conditions for our lacto-fermented products. Most of the produce we use is grown on our farm but any outsourced produce is bought from local organic farms.